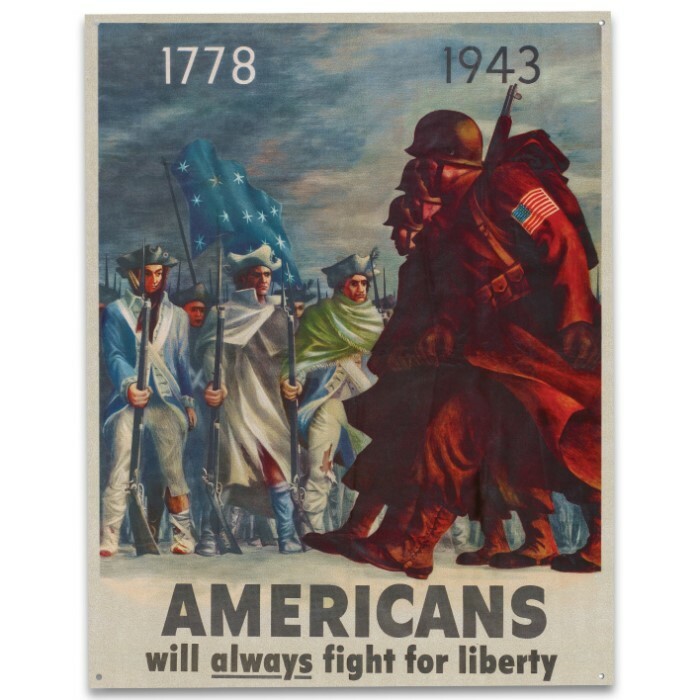 Vintage World War II US Propaganda Placard Reproduction Tin / Metal Sign - 1778, 1943: Americans Will Always Fight for Liberty - Veterans Military History Home Office Wall Decor - 12 1/2" x 16" | BUDK.com - Knives & Swords At The Lowest Prices! Vintage World War II US Propaganda Placard Reproduction Tin / Metal Sign - 1778, 1943: Americans Will Always Fight for Liberty - Veterans Military History Home Office Wall Decor - 12 1/2" x 16"
Honor the brave men and women of America's Armed Forces, while livening your man cave, garage, cabin, vacation home, living room, bedroom, office - literally any space - with this sweet metal sign! Its cool vintage style and vibrant graphics are just what the doctor - or, interior designer - ordered to cure empty walls; dull, lifeless rooms; outdated decor themes plagued by kitsch; or any case of uninspired design in need of a shot in the arm! Most importantly, this eye-catching placard conveys a bold message of freedom, courage and unabashed patriotism; it's the perfect wall piece for veterans, active duty servicemen and their loved ones, and/or proud Americans of all stripes. Easy to hang! And top quality, corrosion resistant metal construction, as well as advanced, fade resistant printing even allows for posting outdoors!